HOW TO “UN” ADDICT YOURSELF FROM YOUR SMARTPHONE: Over the past few years, I’ve done stories on devices that shock you off your phone, safes that lock them away for you, and a ton of apps to track and limit your time on them. But, the problem of tech addition is growing, and it’s still something we’re all talking about. Recently, a parade of tech big-wigs, including several former Facebook employees, have argued that “we’re no match for the sophisticated machinery of engagement and persuasion being built into smartphone apps. Their fears are many: They’re worried about distraction, productivity, how social networks alter our emotional lives and relationships, and “what they’re doing to children.” What’s followed is a ton of speculation about what to do about it. I’ve working on a story beyond the apps and “just say no’s,” to real, d0-able, how-to’s. Be sure to let me know if you have any suggestions! Coming soon to USA Today. ME TOO: Just like everyone else in the Whole. Wide. World. 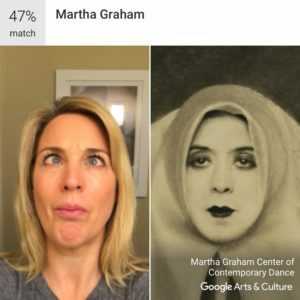 I’m a wee-bit addicted to the Google Arts and Culture App. 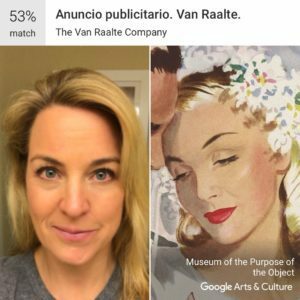 To see your own artistic doppelgänger, download the app, open it, then scroll down until you see “Search with your selfie.” Tap the “GET STARTED” button and you’re off. Warning: if you’re like me, you’ll get a little carried away and emerge 30-minutes later LYAO and trying to convince nearby family members that you’re not insane. Oh yeah, be sure to share with me via social media! For tech-obsessed travelers looking to elevate their next vacation, travel companies are rolling out a myriad of inventive apps, websites and amenities that deliver new and improved experiences. Join Jennifer Jolly — an American consumer technology journalist and TV broadcaster, a Wired Well columnist for The New York Times, tech-life columnist and host of Tech Now for USA Today, and a digital lifestyle contributor for “The Today Show” — as she helps travelers use the latest technologies to get the most out of their next trip. In addition to this seminar, I’m also working on a series of stories with real, actionable advice and takeaways – beyond buying a new gadget (though if you recommend a new gadget – be ready to show and tell why it’s amazing, how much it costs, and why/how it’s better/different than any other similar gadget on the market today. VALENTINES GADGETS/APPS/EXPERIENCES: How can you use tech to show your love for someone without spending a giant wad of cash? What new gadgets will make me fall in love all over again? Since I cover this topic every year, what’s a new/relevant/interesting way to approach it this year? GOT AN IDEA? What else would you like to see me talk about? I had one of the best reader feedback emails of my life last week – all about the newest gadgets at CES – being a giant waste of time and money. I’m working on a follow-up/response to that now, and always, always, always welcome your feedback, thoughts, and ideas! WANT TO WRITE FOR US? OR PRODUCE VIDEOS WITH US? OR PARTNER ON SOMETHING … OR JUST WORK WITH US BECAUSE WE’RE AWESOME? We’re expanding our team and looking for awesome news writers, amazing video producers, social media savants, and all-around great human beings to help us bring tech-sanity to the masses. Reach out via the comments section, or on social media, and we’ll let you know when specific opportunities open up! PR FOLKS: Here’s a little insight: My syndicated audience is about a half-billion people. If you’re pitching me a story, gadget for review, or tech tool, or even trying to get me to interview someone, please pitch a viable, timely, national news headline-type hook. Since a lot of work I do is via video or live TV, think visually and pitch Today Show type segments as well. Of course, I like being the first to tell a story before any of our competitors. Also – please know that I don’t cover press releases or do stories on gadgets that I haven’t gone hands-on with myself. Be ready to send it to our studio (quickly) for review, on our own time (not with a company person having to walk us through it).